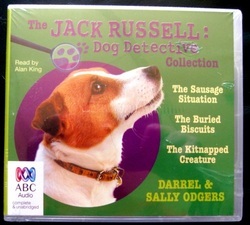 Jack Russell: Dog Detective, is a lighthearted series about Jack Russell, who lives in Doggeroo with his human friend, Sarge. Scroll down to find out about Jack's adventures. The books are published by Scholastic in Australia, the UK, Canada and the US, and also by Kane Miller. 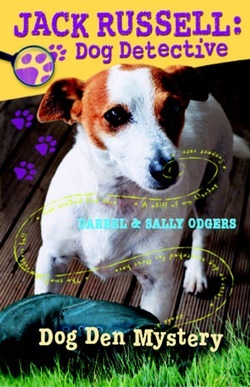 When Jack moves to Doggeroo with his landlord, Sarge, he finds a mystery on his paws. Who is stealing his stuff? 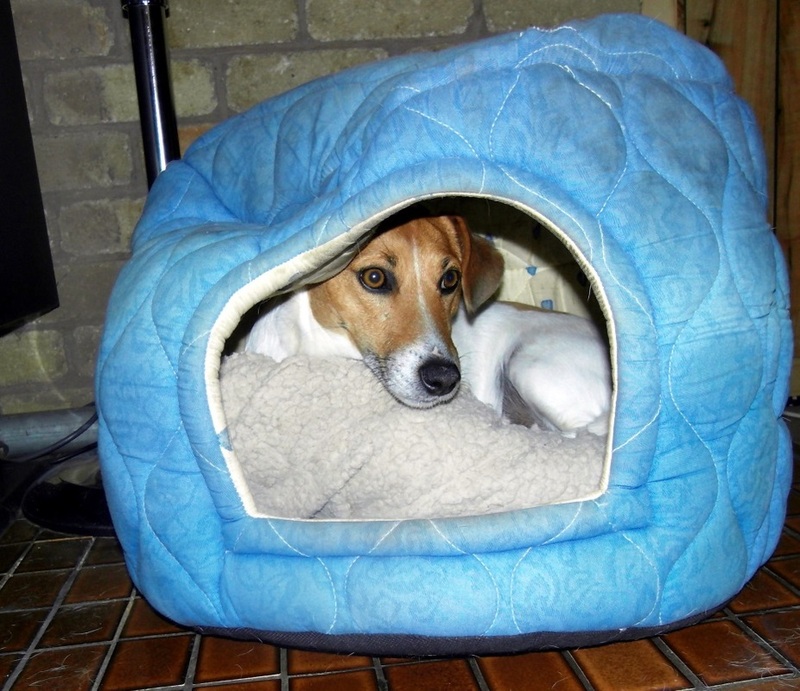 Who is making a dog den in a deserted house? Who owns the old boot in Jack's new yard? Jack is soon hot on the trail of a criminal, but what he discovers is entirely unexpected. In the course of his investigations, he meets Lord "Red" Setter, the streetwise Foxie and many other characters who will become familiar friends - and enemies - in the series. Dog Den Mystery is available as an audio book from Bolinda Audio Books wonderfully read by Alan King. 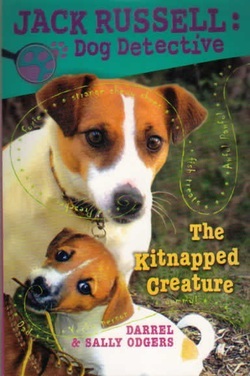 This book is also available in the USA, (under the same title), in the UK (where it is called "Dognapped"), and in Canada, under the title of "Le Voleur de Bottine". Click chapter_one to read the first chapter. Jack and Foxie attend Doggeroo Dog Show with Sarge and Auntie Tidge, and straightaway Jack is paw-deep in a new mystery. Dogs are mysteriously ending up covered in mud just before their classes. The dogs all deny that they're doing it on purpose, so Jack sets out on the trail of the phantom mudder. Before he discovers the criminal, he has a close encounter with some scented pooch polish. It's amazing what a dog detective will do in the line of duty! The Phantom Mudder is available as an audio book from Bolinda Audio Books. 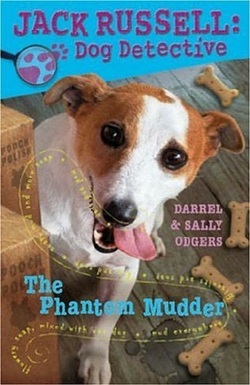 The UK edition is called "Muddy Mystery", and French Canadian children read about "Le Barbouilleur de Chiens". The dogs of Doggeroo are mysteriously losing their collars. At first Jack assumes they are being careless, but it soon becomes obviously there's more to it than that. Jack goes undercover as a careless, trusting dog to try to un-cover the culprit, but no matter what he does, he can't seem to lose his collar. That is, until Sarge borrows it to put on Shuffle the Pug! Finally, Jack discovers the truth and he and the dogs of Doggeroo take action. 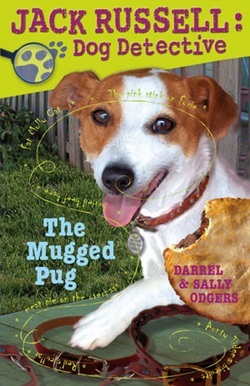 The Mugged Pug is available as an audio book from Bolinda Audio Books. The UK edition is called "Pug in Trouble", and French Canadian children read about "Vols a Val-Cabot". Dogs are dogs, and postmen are postmen. Dogs always bark at postmen. Jack and Foxie know that, but the new postman doesn't seem to understand. In no time he has accused the Doggeroo dogs of attacking him. Things are getting serious and Jack soon realises there's a new dog in town. Is the secretive Ralf Boxer behind the postman problem? Can Lord Red stay out of trouble? Will Jack solve the case? You bet! 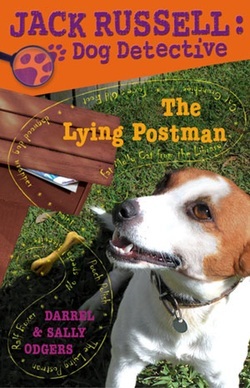 The Lying Postman is available as an audio book from Bolinda Audio Books. The UK edition is called "Beware of the Postman", and French Canadian children read about "Le facteur menteur". Fear comes to Doggeroo! Mysterious attacks are leaving dogs with sore, bleeding noses, but when Jack tries to investigate the witnesses keep stumm. What is so bad that Polly, Jill Russell, the Squekes and Shuffle can't speak of it? Even Fat Molly is too frightened to fight with Jack. And then Jack himself has a close encounter with the Awful Pawful. Something must be done. Jack's the dog to do it, but is anyone brave enough to help him out? The Awful Pawful is also available as an audio book from Bolinda Audio Books. Also available on triple CD (along with The Buried Biscuits and The Kitnapped Creature) from Bolinda Audio, read by the wonderful Alan King. Foxie is on a diet, and Jack has things on his mind. When Auntie Tidge takes delivery of boxes of sausages, Foxie is delighted, until Caterina Smith takes them all away. Foxie is determined that Jack must solve the case of the stolen sausages, but Jack, for once, isn't sure there even is a case. He and Foxie join Lord Red, Auntie Tidge, Sarge, Caterina Smith, Polly and just about everyone else at the Doggeroo Dog and Sausage Day. 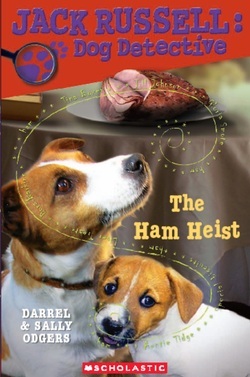 There are sausages galore, and plenty of schemes and drooling dogs, but is there really a thief? Well, yes. Jack solves the case, but he still has other things on his mind. When will Sarge take him to visit his friend Jill Russell? Also available on triple CD (along with The Sausage Situation and The Kitnapped Creature) from Bolinda Audio, read by the wonderful Alan King. Jill Russell has a secret, and Foxie is as angry as a terrier can be. Someone tossed a packet of biscuits over Foxie's fence, and Auntie Tidge took them away. This means war. Since Foxie adores Auntie Tidge he has to fight with someone else- Jack. But Foxie isn't the only dog acting strangely. Lord Red has found something interesting down at the reserve, and soon all the dogs of Doggeroo are playing hunt the biscuit. Bellyaches result, the vet is cross, and the dogs find themselves under house arrest. All but Jill Russell, who is much too busy for biscuits. 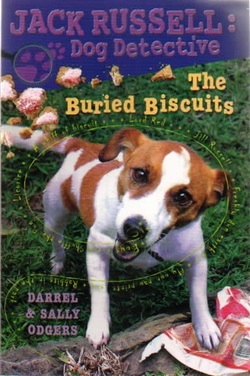 Finally, Jack solves the case, but can he ever look at a biscuit again? Also available on triple CD (along with The Sausage Situation and The Buried Biscuits) from Bolinda Audio, read by the wonderful Alan King. Someone is imprisoned in a horrible cage, but why is Jack trying to get caught by Ranger Johnny Wolf? What is Foxie up to? And just who is sharing Jack's basket these days? Everything is fine in Doggeroo until Sarge falls ill. Auntie Tidge is at hand to look after Jack, but Foxie is being disagreeable (again). When will Sarge be back? In no time, Jack has both a case and a moral dilemma-- or even two. Is it right to leave his most dangerous enemy trussed up in a cage? And, who will mind the boy while he's off detecting? 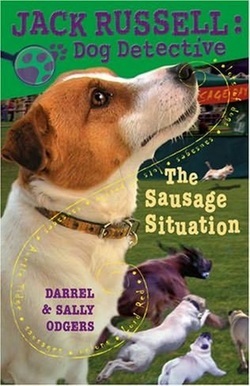 The little dog on the cover here is our very own Preacher, son of Ace. Below, you can see some pictures of Preacher all grown up. So, why the name "Preacher"? Darrel chose it. He was on hand when Preacher, the only boy in the litter, was born. 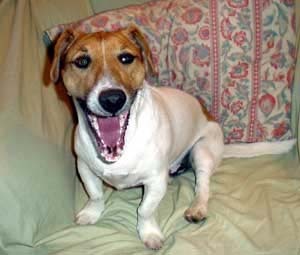 Since the Jack Russell Terrier breed is named after Parson John (Jack) Russell who bred himself a pack of sturdy hunt terriers, it seemed fitting that our little cobber should have this name. Fowl play in Doggeroo! Auntie Tidge and her friends buy some chooks. When you mix fowls and dogs, you get pan-dog-monium with added hen-sterics. 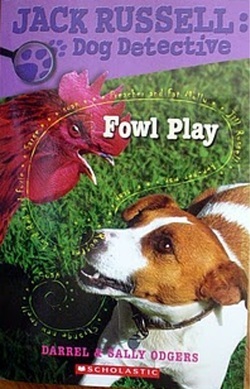 Fowl Play is the only one of the Jack series that has not been published by Kane Miller. However, it can be ordered on line. Sarge and Caterina are preparing for a party. Auntie Tidge is welcoming a newcomer to Doggeroo. Meanwhile, Jack is teaching young Preacher the basics of detection. 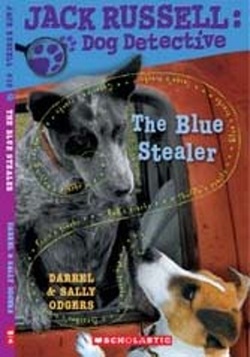 What better place to start than the case of the Blue Stealer! Jack has always been top dog detective in Doggeroo, but suddenly there's a newcomer trying to claim his title. 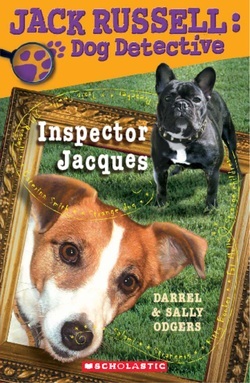 Inspector Jacques is a French bulldog with attitude, and a fang-resistant collar, as Jack discovers. Meanwhile, poor Preacher has run afowl of the terrible dog-boggarts. Jack's person, Sarge, is getting married, but Jack is more interested in guarding the whole huge ham from hopeful ham-heisters. Poor Preacher is still frightened of dog-boggarts, and his mother Jill insists Jack must solve the problem. What's a dog detective to do? Plenty! And as Jack says, the best cases always begin and end with h am. 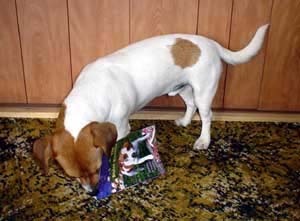 The little dog on the cover here is our very own Preacher, son of Ace. Here's a picture of the grown up Preacher, enjoying some peace and quiet in his favourite kennel.